I’m going to be completely honest here in saying that The Improbable Rise of Singularity Girl is unlike anything I’ve ever read. It’s everything you’re looking for in a book and more. It has a decent pace, it is not predictable most of the time, and it does everything in its power to make sure the world that is created feels incredibly familiar and strange at the same time. Whenever I laid eyes on a page, I was completely absorbed into this ambiguous world, populated by characters that all in all are very real. And especially for me, the nerdy references, everything from Terry Pratchett over Firefly to World of Warcraft, just made everything even better, even more familiar than before – and you can tell that Anderson was having fun there, too. It was only once or twice that I was almost going to put it down because it felt too stretched-out in those points, but as soon as I thought that, it picked up its pace, disaster accumulated, and plot-twists threw themselves at you. 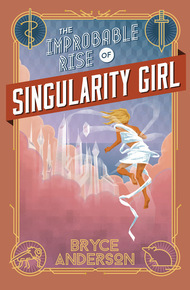 Both in content and in style, The Improbable Rise of Singularity Girl is one of the best books that I’ve read in a really long time; the only regret I have is that I already finished it. If you need something uplifting yet distressing, something innovative yet familiar, a book that will keep you chained to your chair, this one is for you – you won’t regret it.